Interface áudio MIDI Korg PlugKey Bk. Cor: Black. The plugKEY is a portable MIDI + audio interface that is the answer for those who want to use a keyboard of their own choice to play iOS musical instrument apps or produce music. Simply use the plugKEY to connect a MIDI keyboard to your iPhone/iPad, and start playing. A mobile MIDI + audio interface that lets you play your iPhone/iPad using any keyboard. The plugKEY is a portable MIDI + audio interface that is the answer for those who want to use a keyboard of their own choice to play iOS musical instrument apps or produce music. Simply use the plugKEY to connect a MIDI keyboard to your iPhone/iPad, and start playing. Now you can enjoy using your own keyboard to easily play a stupendous array of musical instrument apps that deliver serious sounds and convenient functions. You can use your iPhone/iPad while charging it. Audio interface functionality with stereo output is also provided, so the plugKEY is an ideal choice for those who want to use musical instruments apps in the studio or on stage. A keyboard provides a convenient upgrade to the daily musical experiences you enjoy with your apps, and let you perform to the full extent of every app's potential. 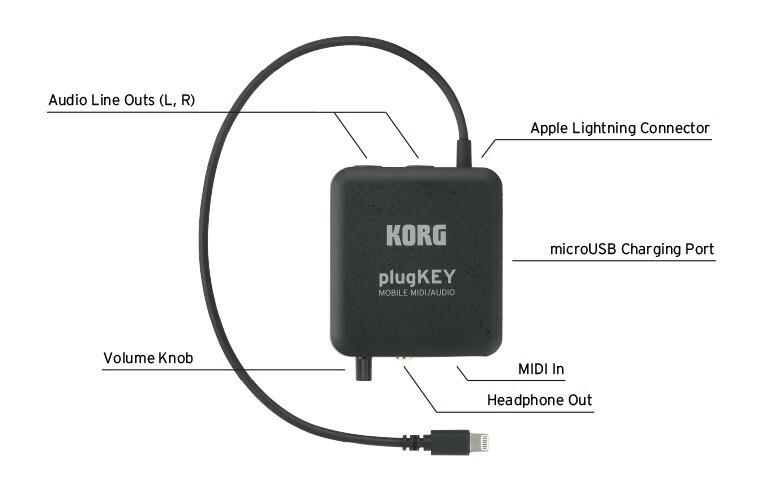 The plugKEY is your key to a new style of music, brought to you by KORG, the company that continues to provide both musical instrument apps and a wide selection of keyboard instruments from synthesizers to electric pianos. Your iOS device becomes a musical instrument. Certified as "Made for iPod/iPhone/iPad"
With the plugKEY, a rich selection of iPhone/iPad musical instrument apps such as KORG Module and Apple GarageBand can be played seriously and easily from your keyboard. Just plug the Lightning connector of the plugKEY into your iPhone/iPad, and use a MIDI cable to connect the plugKEY to your keyboard. Because the plugKEY is certified by Apple as "Made for iPod/iPhone/iPad," there are no settings that you need to make. The power is supplied via the Lightning connector, and because it's a wired connection there are no latency issues. The plugKEY is ideal for players who have exacting requirements for tight timing. 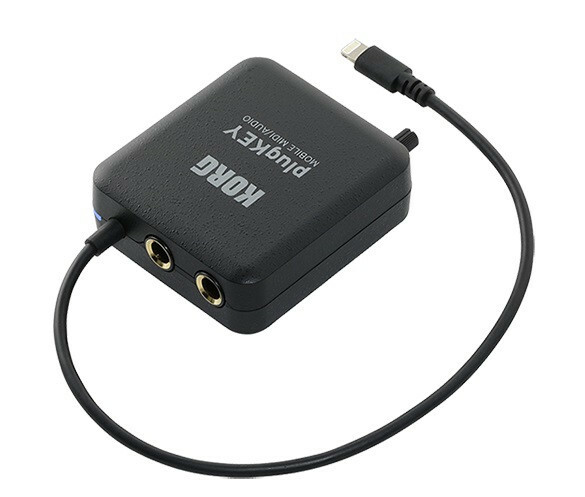 * A MIDI cable is not included; you'll need to purchase it separately. 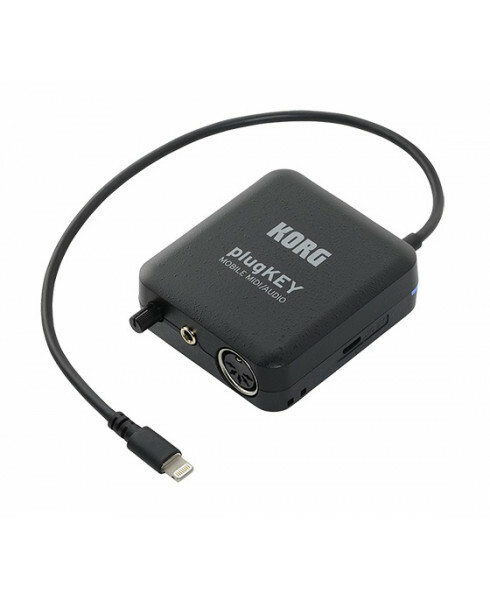 For example, if you use the plugKEY to connect an iPad that has KORG iM1 or iPolysix installed, you have your own sound module. You can use it to expand the possibilities of a synthesizer, or take it with you and play your own familiar sounds from any keyboard provided at a rehearsal studio or live venue. Take advantage of your iPhone for piano practice. Do you have an old, unused digital piano at home? 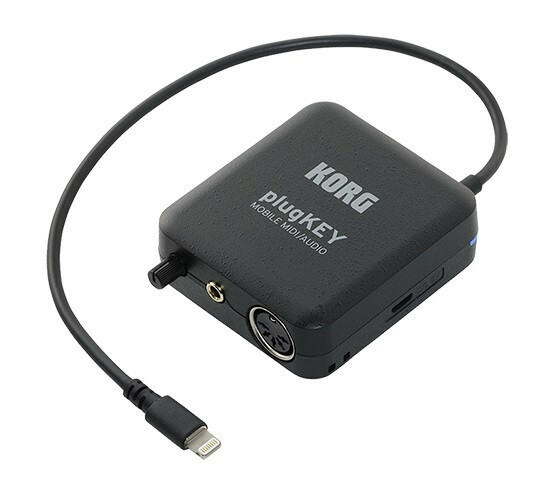 Use plugKEY to connect your digital piano to an iPhone that has KORG Module installed, and your old digital piano will be reborn with the latest high-quality piano sounds. The plugKEY provides not only MIDI but also high-quality audio interface functionality for your iPhone/iPad. It features 1/4" jack audio outputs, so you can have confidence that the plugKEY will withstand the rigors of the stage or studio. This means that your iPhone/iPad can evolve into a real musical instrument. There's also a volume knob for smoothly adjusting the volume, as well as a headphone jack (stereo mini-phone). * The internal speaker of the iOS device turns off when the plugKEY is connected to an iOS device. Since the plugKEY is equipped with a DC5V microUSB port, you can charge your iOS device via the plugKEY. This allows you to use your musical instrument app without worrying about remaining battery life, an important consideration for extended music production sessions, studio rehearsals, or live performances. * A microUSB cable is not included; you'll need to purchase it separately. * The DC5V port is only for charging, and should not be connected to a computer. With carefully selected minimum functionality such as MIDI input, audio output, and charging, the plugKEY features a compact design that's similar in size to the iPhone. When connected to your iPhone/iPad and MIDI keyboard, the plugKEY itself will unobtrusively fit anywhere, and can be conveniently carried to the studio or anywhere. You can choose from black and white models to match your iPhone/iPad. So that you can start playing as soon as you purchase the plugKEY, we've provided some great free iOS apps that you can download from the App Store at no charge: "KORG Module Le" is a high-quality sound module app equipped with a pro-level sound library that includes a high-capacity piano sound module, and "KORG Gadget Le" is a music production app that contains numerous synthesizers and drum machines with serious sound design potential. On both of these iOS apps, connecting the plugKEY will unlock a wide variety of sounds and functions, letting you enjoy high-level performance and music production. * Newer devices than the ones listed here, including the ones with the USB-C port, are not compatible. Weight: 69 g / 2.43 oz. * “Made for iPod,” “Made for iPhone,” and “Made for iPad” mean that an electronic accessory has been designed to connect specifically to iPod, iPhone, or iPad, respectively, and has been certified by the developer to meet Apple performance standards. Apple is not responsible for the operation of this device or its compliance with safety and regulatory standards. Please note that the use of this accessory with iPod, iPhone, or iPad may affect wireless performance. * iPad, iPhone, iPod, and iPod touch are trademarks of Apple Inc., registered in the U.S. and other countries. iPad Air, iPad mini, and Lightning are trademarks of Apple Inc.